Plot: Eragon, the once-loved dragon rider that killed Galbatorix, has gone insane and became a near-carbon copy of Galbatorix. The people who join are the only remaining dragon riders, but are individually much weaker than Eragon and Saphira. Additional Rules: No double posting; cusing is to be kept to an absolute minimum, and completely avoided if possible; proper grammar, but one or two mistakes are acceptable and fine if you're an Urgal with rough English; no godmodding (playing your dragon is NOT godmodding, as it is one of your two characters); you are not powerful in magic or particularly skillful in battle but become more powerful as the story wears on; NONE OF THE 12 WORDS OF DEATH; My character will be an (unexpeirianced, to be fair) elf but others can choose between elf dwarf, Urgal, or human characters; Look here for most questions; no spamming; no flaming; There will be at least one elf (me), one human, one dwarf, and one Urgal player; The only time to use the ancient language is when casting a spell; rules of magic apply, such as a spell takes the same ammount of energy out of the user as it would take them to do it without magic (example: if I were to try to cut a peice of bread with a spell, it would take very little energy out of me. If I were to try to break a boulder, I would die as it is not possible except for the strongest Kull to do); no ressurecting the dead; your name, like my username, can not be a word from the ancient language. However, your dragon and/or sword can be; you, nor anyone else, knows another character's or your own true name. Personality: Has a relatively short temper, but it nearly never ignites with friends, recognizes potential allies, smart but greatly over-thinks most simple things. History: Was hiding in Ellesmera when Eragon, the 'revered' dragon rider, came down on his dragon Saphira. No one was suspicious as he regularly visited Ellesmera. But suddenly, he and his dragon started to kill Riders and elves left and right. Dusan, as soon as the murderer was gone, stumbled upon a green dragon egg. The dragon hatched for him. Now, he is on a quest to destroy the newest mad king. Last edited by Edoc'sil on Sun Feb 13, 2011 7:52 am, edited 3 times in total. Personality: Nerago puts duty and obligations before all else. If a commanding officer were to give him an order, Nerago would perform it without question. However, he also conforms to strict moral standards, so if said officer issued a cruel order, Nerago would be the first to strike him down. However, if Nerago finds you to be a friend, he will try his hardest to remain true to that friend. History: Nerago was born in the Dwarven city of Farthen Dur, to two members of the resistance. Nerago's first years were spent learning swordplay and archery; he grew up thinking of nothing except for combat. At eighteen, he finally joined the Resistance actively, and soon became commander of his own unit. He was awarded for exceptional bravery at the battle of the Burning Plains, where he slew 30 Urgals before having to fall back. Throughout the war, Nerago served with honor and devotion. When Eragon and Saphira overthrew Galbatorix, he was one of the first to sign up for the new Alagaesian Army. Quickly rising through the ranks, Nerago attended a standard egg parade, watching as unclaimed dragon eggs went through the streets. As he touched one of the eggs, the Gedwey Ignasia appeared on his hand, and he knew he was destined to be a Dragonrider. His egg hatched, and he named the resulting blue dragon Valian, short for Valiance. Valian and Nerago became close; however, over time, they realized that Eragon was slowly being driven mad. Consequently, they separated themselves from the other Dragonriders, and left for parts unknown. Appearance: Nerago's appearance has gradually become more elf-like over time, like many human Dragonriders. Has ice-blue eyes, which are shaped like an Asian's; slightly pointed ears; tanned skin. 5'10", and well-muscled. Black hair. Last edited by rex09 on Sun Dec 19, 2010 9:41 pm, edited 2 times in total. History: Nepharant is a half-human/ half-Urgal hybrid born in Uru'baen. When Eragon took role as the new Dragon Rider and king of Alagaesia he managed to incorporate humans and Urgals together. Most didn't agree with the idea of the two species living together after such bad times between them in the past. Nepharant's mother was human and his father was a large Kull. They didn't think that a child hybrid could have been the result of their love, but they were wrong. They expected the child to be either full human or full Urgal, not a perfect mix. Nepharant was raised by both his parents like most children, his mother teaching him about being human, and his father teaching him about being an Urgal. They realized that he grew large like a normal Urgal but lacked the crude and rough figure of a Kull. Nepharant had the body figure of a strong human, but his strength far surpasses human standards. When he and his father were out on a hunt, Nepharant came across a large nest that was between a circle of closely grown trees. The nest had been abandoned for some time since there wasn't much left except a single crimson egg. When Nepharant touched it the egg instantly became warm and nudged in his hands. His father discovered this and told him that the human in him allowed him to be chosen as a Rider. They went home and his parents helped Nepharant pack to leave for the elven city Ellesmera for training. He left his home with the egg in a pouch around his neck and his pack on his back. His dragon hatched on the way and he took care of him, as is his duty. Months passed as he trekked through the wilderness, and then he came upon a small village to a river. There he saw that the city of Uru'baen had been destroyed by a rogue Rider that was sent by the now corrupt King. Fueled by Nepharant's anger, the baby dragon grew faster by using his powers to meet his Rider's needs. They are both currently in the elven city Osilon, where he forged his sword. Personality: Nepharant has a bold personality with some anger issues, but that's due to his genetics. He is very logical and keeps his mind open to the possibilities. He's very creative but gets frustrated when he can't get a grasp on something. If the group he's in falls into chaos, he assumes command and settles out the issues as fast as he can. Nepharant has blood-lust in battle and can be very brutal in fights. Appearance: Between a tall human and medium Urgal height. Nepharant has small horns that curve back a little. His face looks mostly human except his large fangs that stick out from his mouth and his dark eyes. His skin is hard and mud colored. He is very muscular and powerful looking. He has a short black hair. Last edited by redt on Mon Dec 20, 2010 3:35 pm, edited 1 time in total. Accepted, and for the last player we need, (a dwarf) let's just say the spell has been edited to allow full dwarves to become a Rider. Dusan was taking the guard. It was night and they weren't taking chances. He held his sword tight and his bow and quiver at the ready on his back. He heard a rustle in the underbrush, but it was just a mouse. "Stop being so paranoid!" he thought irritatedly. I peered into the forest. Night had fallen, and the mountains of Alegaesia always seemed chilly this time of year. Beside me, I heard Valian snort. I can smell something that is not an animal in the forest... I looked up at the immense blue dragon. The moon was set behind his majestic head, outlining the curves of his horns and the ridges on his head. Chuckling, I noted, "True, but when we received word of this resistance movement, we knew what we were getting into." Valian looked at me, his eyes shimmering frost-blue. Little one, it seems as though you always point out a piece of crucial logic. Let us advance into the forest, but keep Oxius handy. Grinning, I nodded and placed my hand on the pommel of my trusty hand-and-half sword. Striding into the forest, Valian and I looked around warily. It was dark, and I could hear the movements of the night animals throughout. As we walked, I reflected on the past year and a half since I'd left the Dragonriders; it seemed as though everywhere I went, poverty and violence abounded. It appeared as though the news we received at Vroengard was being changed somehow by Eragon - or accurate intelligence never existed in the first place. At every place I stopped, the townspeople had begged for food, for rescue from the army; and I felt the sorrow swallowing everything in my heart, knowing that I had been a part in forming this tyranny, and could do nothing to remedy the mistake. Suddenly, Valian swung his head to the right. Beware! I smell an intruder! I drew Oxius, then advanced forward slowly. Unfortunately, I stepped on a branch, which snapped loudly. Wincing, I moved forward slowly, and came across a small clearing, surrounded by looming trees. Within, there was a small fire, but nobody was nearby. Wondering if this was the one who had contacted us, I receded into the shadows and waited to see who would claim the fire as their own. Dusan heard a sound, but he maintained his spell. He had, like so many other magicians, knew the spell of bending light to make him nearly invisible. He had swept away his footprints and didn't have to worry about his shadow seeing as it was night. "Bisingr," he murmured, and a fire hovered above him. He moved it around to check for signs of danger. The Spine was, of course dangerous. A cold breeze ruffled his hair and he put out the searchlight. Dusan sighed. This wouldn't be easy. Beroan, his green dragon, continued to snore. Blending in with the shadows, I had been slowly creeping along with the undergrowth, disturbing nary a mouse nor a piece of grass. In this manner, I walked around the fire, then explored the forest some more; I knew that eventually, the mysterious stranger would return. It was only a matter of time before they came back, either to rest or to cover their tracks. Valian had taken to the treetops, hunting small birds and squirrels for sport. I felt his emotions as he enjoyed the rush of the hunt, however small the game; but I knew that Valian's size and lack of stealth would soon give us away, so I quickly left his company, making sure to maintain our mental connection. Valian snorted, but sensing my intent, left me to my devices. As I crept through the forest, I thought about the manner in which I had heard of this strange rebellion. A single man, looking to overthrow the single greatest Rider since Du Fryn Skulblaka itself? It was madness, and yet, it needed to be done. I shook my head; this was probably the most foolish thing I had ever done. Not even joining the Varden and committing myself to various missions doomed to end in my death had seemed so crazy. But here I was, alive and ready to hunt Eragon and Saphira, my onetime liegelord and friend. Suddenly, one of my wards went off, alerting me to the use of basic magic nearby. I rapidly checked my surroundings, and there! - I caught a glimpse of a fire extinguishing itself. I alerted Valian mentally of my intents, then crept toward the mystery fire. Dusan felt a fool. He extended his mind and immediately recoiled it. "Beroan!" he thought urgently. "Awaken, htere is another dragon in the forest!" He shot up a tree to sentry, immediately releasing all magic. He drew Kevykeya. Beroan slowly rose, making sure to maintail stealth- until he scented the dragon. It was around his age and probably height. Beroan reared up and spread his wings. He also bared his teeth in a snarl. "Reveal yourselves!" he challenged. Dusan sighed. It was no use in hiding any more. Dusan shot down the tree and stood next to Beroan, sword at the ready. Valian dropped down next to me, and roared at the green dragon. We faced off against the mysterious dragon and Rider. As I studied his features, it occurred to me that this was an elf. What in the world was one of his kind doing here, far from the boundaries of Du Weldenvarden?? While it was true that some elves had begun to venture further from the forest, for the most part, they remained in their cities. Last edited by rex09 on Thu Jan 27, 2011 6:47 pm, edited 1 time in total. 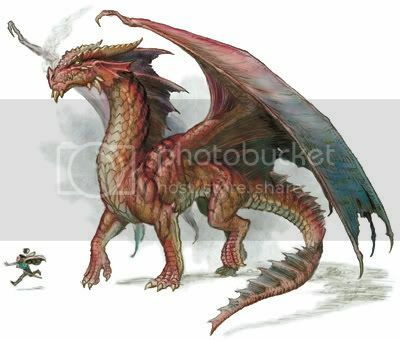 Appearance: Drakvault is a tall Dwarf compared to others, around 4 feet tall. His face has a red beard and is a normal face. Gilgieth has large horns. His wings are large and black with spines along the back. "And I am Beroan," Beroan interrupted. Dusan's eyes softened but his thoughts were carefully guarded by a look of boredom and a smooth mental barrier. "As I was saying, I became aware of Eragon's ironic turn when he," Dusan swallowed, remembering the painful memory, "when he torched Ellesmera, killing all of my friends and family." Dusan pointedly looked to the North Star. "I am aiming to to topple Eragon and Saphira, and also make sure no dragon Rider ever becomes king. It has never ended well." Dusan checked his wards and glanced at Beroan, and they were equally cautious. I trust them now, but I'm wary, Beroan said. I agree. But we must still seem friendly, Dusan agreed. "Well, then, I greet you, Dusan and Beroan. I was a soldier in the Varden, then served in the Alagaesian army. I was a little older than normal to have a dragon hatch for me, but the Gedwey Ignasia appeared on my hand at an egg-hatching ceremony, so I joined the Riders at Vroengard after Valian hatched for me. When Eragon began committing atrocities, I left the Riders. And a good thing, too; I'm told that it was destroyed some weeks after I left. Do you have any news of Alagaesia, or an idea of where we're beginning this revolution?? The Varden are long gone, disbanded after the overthrowing of Galbatorix, so where will we obtain allies from?" I looked questioningly ((is that even a word?)) at Dusan. It occurred to me that my sudden outburst might seem a little strange, but Valian and I had been living apart from Riders for so long that to meet one who would revolt against the Mad King was deeply gratifying. Little one, although I am now convinced of their trustworthiness, I would not reveal too many secrets about us. If we are captured, and Eragon's spellcasters get a hold of us, they would not remain secrets for long. I nodded. I will keep that in mind, Valian. Thanks for the advice. Dusan thought for a moment before replying, "Well, the way I see it, when Eragon killed Galbatorix, it was only him, a single dragon rider, against a much ore experienced one. As of now we have two dragon riders and facing another not nearly as long-lived as Galbatorix. The odds seem to be in our favor," Dusan said. "But, Eragon has been much more thoroughly schooled in the field of magic," Beroan cautioned. "Well, then it would seem we need to learn more magic. Personally, I would think that the Council of Elders would be the easiest choice for teachers; but since I doubt any of them have survived or could be found, that's not an option. So, where can we go to improve our skills without being found?? Ellesmera and Vroengard have been destroyed, and Uru'baen is definitely not an option. Any ideas?" I sat down and quickly made a fire by muttering "Brisingr," under my breath. Valian settled down beside me, listening to the conversation, but not really participating. A smirk flickered on Dusan's face. "I was hoping that the Spine may hold some secrets, which is exactly why I came here. Arguably the most mysterious place in Alagaesia deserves to be examined, I should think." "My only concern is that Eragon was raised next to the Spine and has considerable experience with it," Beroan rumbled. Dusan pulled a log over and sat on it, warmed by the fire. Beroan's emerald-colored eye sparkled from the light. Valian chose this moment to put forth his opinion. However, if you will recall, not even Galbatorix, who had over a century to consolidate his rule over Alagaesia, managed to completely control the Spine. The Urgals would not take kindly to soldiers invading their homes and villages. This makes it the perfect place to learn magic in. I nodded my agreement. "So we're settled, then? I guess we'll be heading to the Spine pretty soon." I looked into the flickering flames, entranced by the play of the orange and red light. Valian seemed in a somewhat talkative manner, so he voiced another question: Will we be flying everywhere we go?? It would take half as long, but Eragon and his men would notice us for sure. I pondered this question. It was a good one. Should we fly, which is easier and faster, or walk everywhere, which is tedious but more stealthy? I looked at Dusan, waiting for his input. This Dusan was prepared for. He stood and uttered the spell that bends light to make you invisible; now the four of them were all unable to be seen. "The only drawback is that shadows and footprints are visible; we would be able to fly, but we'd have to go at a high altitude to remain.... hidden." Dusan released the flow of magic. "It may be our only hope of doing anything fast.. but there are still risks. We would also have to try to hide behind clouds lest the sun strike us in the right place and a sharp-eyed person notices that two blue and green 'hawks' are flying in the sky. We would also have to be careful of where we fly in order to find a suitable place to rest." Dusan cautioned. I nodded, impressed with the ease and familiarity with which Dusan used the spell. "I'll add a ward that will warn us if someone notices us; it'll be specific to humans and Urgals, however. Mostly because Eragon's men are humans, and who has ever trusted an Urgal?" Chuckling a little, I leaned back. My weariness suddenly set upon me, and I yawned loudly. "Well, I believe that I'll sleep now, or as much as any Rider or elf can. If you take the watch, then wake me up for my shift, I would be much obliged." Valian curled up, his tail near his forelegs. I leaned against his side, feeling the gentle rise and fall of his lungs. As I hunted for soldiers of Eragon to kill to exact my revenge over and over again on, Gilgieth noticed some strange birds"Drakvault, let us go investigate, they might make a delicious meal." 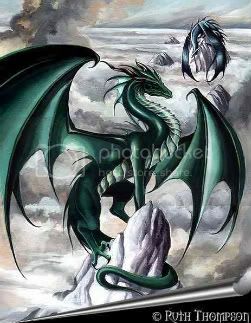 "Great idea Gilgieth", as we approched we saw they were Dragons, "The only dragons are controlled by Eragon it is time to prove ourselves" "To the attack Gilgieth! "As Gilgieth dove he bit a red dragons wing. Last edited by graah2 on Wed Feb 09, 2011 5:01 am, edited 3 times in total. Dusan nodded and fixed his gaze to the sky. Beroan sttled down to gaze at the sky. "Well, this is fortunate," I thought. "It seems as if I've found an ally."